04-May-2002 -- This site is located on private property. We contacted the land owner and met him at the front gate. He walked with us to the confluence. The folks in this country are very sensitive about strangers coming on their land. It is their land and they have that right. He did not want his name published nor did he want any photos that might identify the site to be posted. He was interested when we told him that this project would be useful in biology or geography class as the students could click on a confluence and see the surrounding terrain. 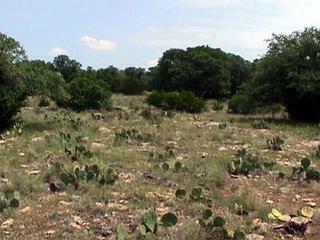 The confluence is on flat land covered with sparse grass, live oak, mesquite, prickly pear and other plants. This part of Texas is known as the Edwards Plateau or The Hill Country. It is a cattle, sheep and goat ranching area. Pecans are the orchard crop. The average annual precipitation is 25.9 inches. This area of Texas is the setting for Elmer Kelton’s [book] The Time It Never Rained. Photo #1 is facing east and shows the general terrain.